Working for Wetlands, which focuses on the rehabilitation, protection and sustainable use of South Africa’s wetlands, while contributing to the creation of employment as part of the Expanded Public Works Programme. National Wetland Inventory, which is involved in mapping the extent, distribution and diversity of freshwater ecosystems in South Africa. National Freshwater Ecosystem Priority Areas project (NFEPA), which aims to identify a national network of freshwater conservation areas and to explore institutional mechanisms for their implementation. Recognising the value and threatened status of South Africa’s freshwater biodiversity, and the need to build competence and leadership in this area, SANBI has established a programme focusing on freshwater biodiversity. This is in line with the establishment of other biome and ecosystem programmes within the institute. The freshwater programme promotes integration, coordination and synergy between initiatives, thereby allowing a programmatic approach to be adopted. Working for Wetlands started rehabilitating wetlands throughout South Africa 10 years ago. Currently there are 40 projects in all provinces that see to it that degraded wetlands are rehabilitated. 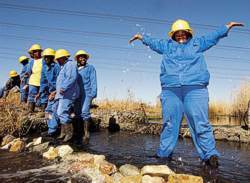 Through Working for Wetlands, over 800 wetlands throughout South Africa were rehabilitated. Through the National Wetlands Inventory, over 114 000 wetlands were mapped and classified using the newly-developed South African Wetland Classification System, through the National Freshwater Ecosystem Priority Areas project. Through Working for Wetlands, above 15 000 job opportunities were created for people from vulnerable and marginalized groups. Funding for training of Expanded Public Works Programme beneficiaries was accessed from the Department of Labour. Over 100 000 training days provided and over R50 million spent on training of project beneficiaries. Enterprise development training and support to contractors involved in the programme was provided, allowing them to establish successful independent businesses. Visit the Working for Wetlands website.